A couple of 13-0 teams, Texas and Alabama, will meet for the Citi BCS Championship game in the Rose Bowl this Thursday. At the end of the day, there will be only two teams to have a perfect 14-0 record, the winner of the Championship game and the Fiesta Bowl winner, Boise State. It seems to me that Boise State has the right to call themselves National Champions. I am not alone in having this outrageous thought. Joe Posnanski has an interesting article at SI.com, titled “After undefeated season, why can’t Boise State be national champion? The Broncos went undefeated. They pounded an Oregon team that went to the Rose Bowl. They rolled through the year undefeated — only one team all year stayed within one score of them. And, finally, the Broncos won a gritty 17-10 game against No. 3 Texas Christian Monday night in the Fiesta Bowl. They have the resume. They had the perfect season. Read the whole article and see if you agree with his argument. I find it pretty persuasive. If anyone is selling “Boise State National Champions” T-shirts, save an extra large for me. People said the same thing after the 2007 Fiesta Bowl. 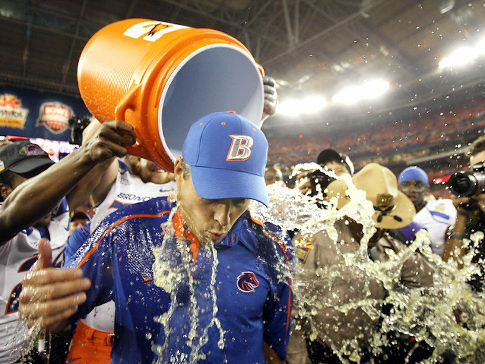 The only way the Broncos will be champs is if they declare themselves champs and to hell with the BCS. Watch the same thing happen next year. The powers that be will make sure the national champion is one of the traditional BCS conference winners.